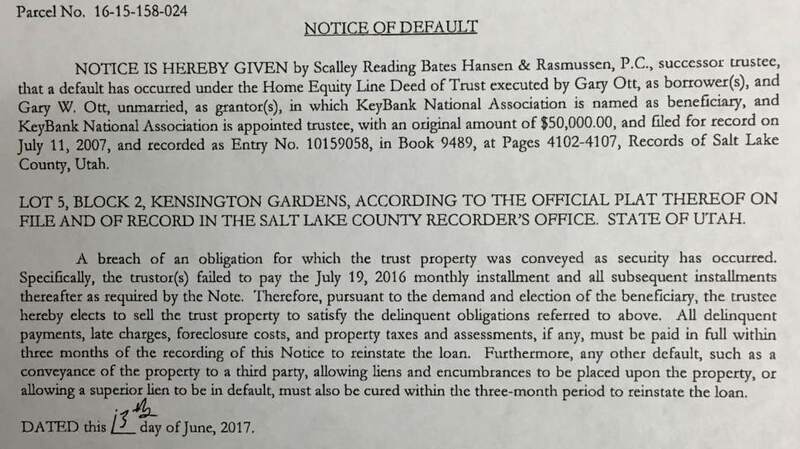 Salt Lake County recorder hasn't paid toward his $50K home loan since July. 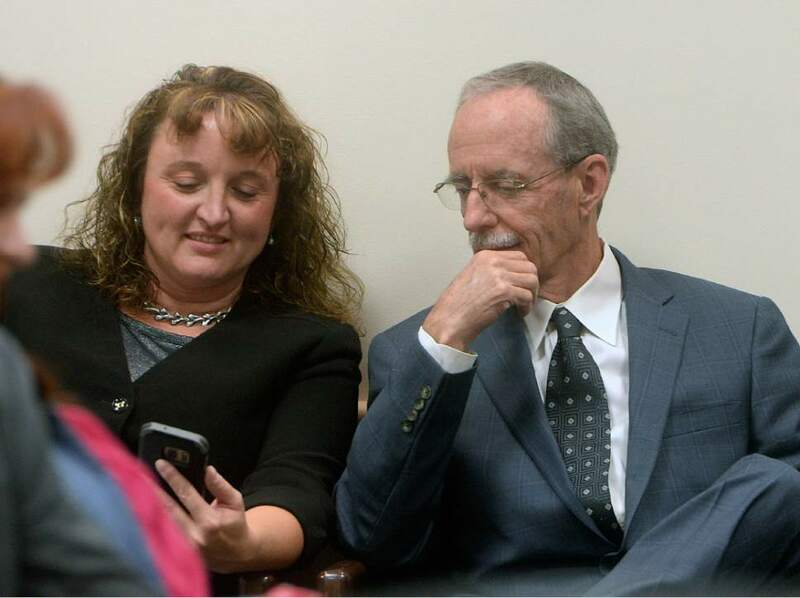 Courtesy of the Salt Lake County Recorder's Office Al Hartmann | The Salt Lake Tribune Salt Lake County County Recorder Gary Ott sits with his chief deputy, Julie Dole before the Salt Lake County Council is to present findings of the county auditor's performance review Tuesday, Oct. 4., 2016. A week later, the Salt Lake County Republican Party censured Dole, accusing her of hiding Ott's health status. 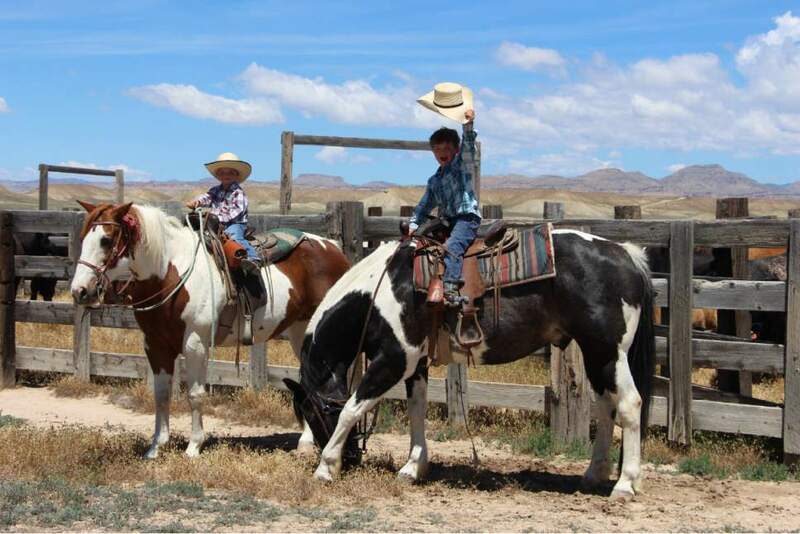 Courtesy of the Salt Lake County Recorder's Office Photo courtesy Jeanie Wilcox Jensen Jett and Jax Christensen at the end of the winter range roundup. Al Hartmann | The Salt Lake Tribune Salt Lake County County Recorder Gary Ott sits with his chief deputy Julie Dole before the Salt Lake County Council's presentation of findings of the county auditor's performance review in Oct. 2016. A week later, the Salt Lake County Republican Party censured Dole, accusing her of hiding Ott's health status. 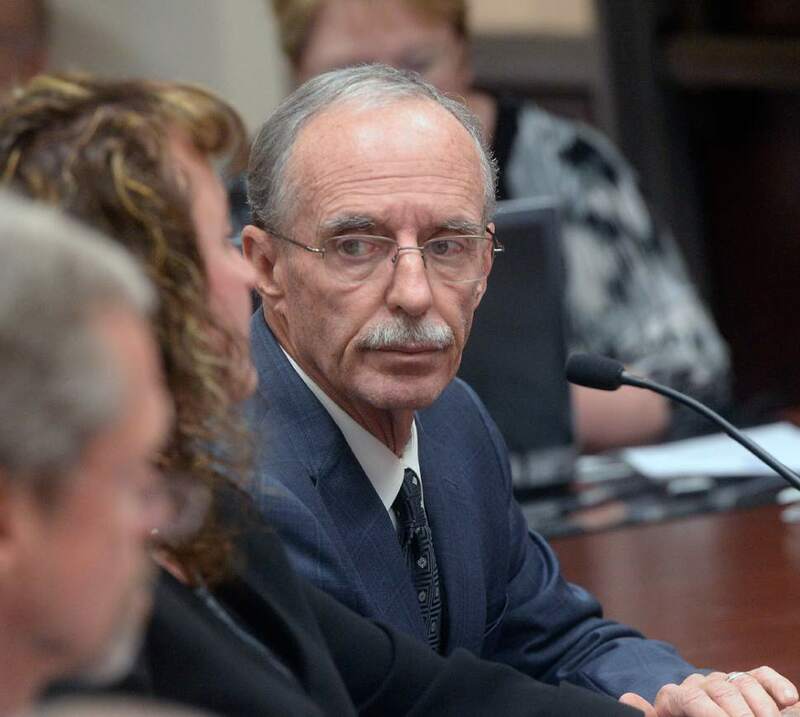 Salt Lake County Recorder Gary Ott, who possibly has dementia and is at the center of a dramatic push to remove him from office, could lose his home within three months for his apparent failure to pay on a home equity loan. The embattled recorder&apos;s office received a notice of default Tuesday announcing Ott hasn&apos;t made a monthly payment on a $50,000 home equity loan since July 19, 2016. If Ott  who is paid a base salary just under $149,000  doesn&apos;t pay the amount owed within three months, he will lose the Salt Lake City home, according to the filing. A separate document also obtained by The Salt Lake Tribune shows Ott received the 35-year home equity line deed of trust with a variable interest rate. The terms of the loan show the lender is capable of taking over the property to retrieve payment without going to court. Houses in default typically are sold at auction, with the lender taking proceeds to satisfy the loan. County records show the property is the only home Ott owns in the county. Ott&apos;s longtime friend and current aide Karmen Sanone said the matter would be straightened out quickly. "Gary just found out about the notice of default today," Sanone said. "We have a meeting set up with the parties tomorrow to straighten it out." 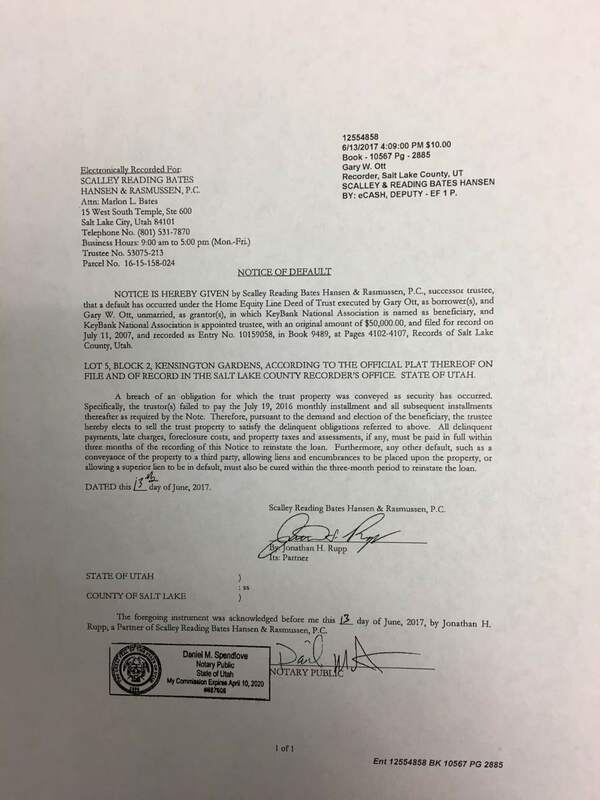 The notice of default, combined with a mailbox that Wednesday was overflowing with mail and a notice on his door of water service shutoff for lack of payment, call into question where Ott resides. No one answered a knock at the door, and a banged-up blue sedan sat parked in the house&apos;s driveway. As all elected county officials, he is required to reside with Salt Lake County. Through aides, he has insisted he abides by the residency requirement. Still, Ott is under pressure from public officials who say it&apos;s time for him to step aside amid his absence from office, but there is little they can do to force the issue because he was elected to serve through 2020 and Utah law has no provision for removal in such circumstances. Ott&apos;s chief deputy, Julie Dole, is effectively acting in his place. Dole, who receives a $140,166 base salary for her role, has said Ott has always had a hands-off style and chooses to delegate responsibilities to his employees. Ott is also likely suffering from mental health issues that have rendered him unable to perform his public duties. Sanone told police in September that Ott has dementia, according to a police report following a welfare check on Ott at Sanone&apos;s Weber County home. Officers took Ott to the hospital after deeming he was a risk to himself. When authorities got in contact with Sanone, she told a sheriff&apos;s deputy "that [Ott] does have dementia," according to police reports from the Sept. 2, incident. Sanone on Wednesday said she should have been more specific with the deputy because dementia "is a broad term." "If you talk about dementia as Alzheimer&apos;s then, no, it&apos;s not Alzheimer&apos;s," she said. "If you&apos;re talking about broad dementia where he may have trouble articulating, then maybe" he has that, she said. Records also show North Ogden police checked on Ott at a grocery store last month, where an employee said an elderly man  later determined to be Ott  was confused and didn&apos;t know where he was. The officer dropped Ott off at Sanone&apos;s house. Ott hasn&apos;t responded to multiple calls for comment to a number associated with him, and Sanone said he wasn&apos;t available Wednesday. Sanone has said she is acting as a spokeswoman for Ott, and this week she told county Republicans that Ott was willing to consider terms for his early retirement. The update was significant, as county officials have explored their options for forcing his resignation but found they are essentially limited to cutting his salary. It&apos;s not clear whether Sanone is authorized to negotiate Ott&apos;s resignation from office, though a copy of her job description shows she is paid a base salary of $58,032 annually to perform a wide range of duties as Ott&apos;s exempt secretary. Sanone performs in a "confidential capacity" for Ott, according to the job description, obtained through a public-records request. Notably, the position entitles Sanone to answer the phone and personal inquiries for Ott, as well as speak on his behalf. Sanone "may serve as liaison for [Ott] and be a representative to various groups, individuals, employees, boards, committees, and the general public." Republican activist Jeremy Roberts had filed a complaint alleging Ott was being exploited and manipulated in violation of state law by aides interested in keeping him in office against his own best interests to continue drawing paychecks. The Salt Lake County Council held a closed session with District Attorney Sim Gill on Tuesday, but declined to discuss details after convening. Gill said recently his office was conducting a criminal investigation into the matter. "Everybody has a responsibility to try to do the right thing, and to preserve as much dignity to somebody who may be gravely compromised," Gill said. "Anybody who does not help facilitate that is morally and ethically bankrupt."